The Full Moon Romance Slot by Thunderkick is a 15 paylines video slot with five reels and three symbols each. The game is compatible on desktop, tablets and also smart phones. The game has an unusual design and looks like an old open-air cinema from the 1950s. The Full Moon Romance slot is a nice game with simple but lucrative bonus features – for beginners the slot is perfect. The slot was released in 2017 – it is one of the newest games of the Swedish games factory Thunderkick. As always, you can also play the Full Moon Romance here for free. As we mentioned earlier, the Full Moon Romance is kept simple. You know the 15 payline after a few spins and the same applies to the symbols: You play with the playing cards symbols J, Q, K and A. The game related symbols are a puppy love dog tags, a bouquet of roses and two sweethearts named Jack and Rosie as the highest paying symbols. There is an auto play function where you can set up to 5000 spins. In addition to the symbols mentioned above, you also have a Wild Symbol and a Scatter – the Full Moon. The Wild symbol works as usual: it replaces all symbols except your Scatter symbols, forming additional winnings. The Scatter Symbols, on the other hand, will trigger Free Spins, if it lands on your reels at least 3 times. 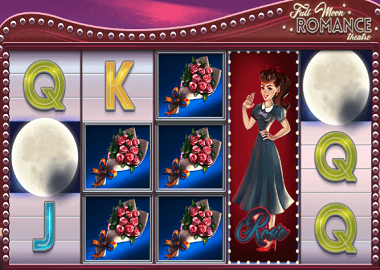 Full Moon Clone Feature: The special feature of the Foll Moon Romance Slot are the two sweetheart symbols Jack and Rosie. If one of the mega symbols appears on the first reel, it will be interesting. The symbol is then cloned on up to 5 reels and delivers fantastic winnings even in the base game. In addition to the Free Spins feature, this is the best feature. Full Moon Romance Free Spins: When you get 3 Full Moon symbols, you activate 10 Free Spins. If you land 4 of the Scatters, there are 15 Free Spins and with 5 Full Moon symbols, you trigger 20 Free Spins. In the Free Spins feature, the two sweetheart symbols Jack and Rosie are transformed into a werewolf symbol. Just as in the Clone Feature, you can land bigger winning combinations. The Full Moon Romance Slot is an ideal game for beginners and also for high rollers. You can play from £0.10 up to a maximum of £100. There is a theoretical Return to Player (RTP) of 96.1%. Click on the banner above and test the video slot here for free. More Thunderkick games to play for free, you can find here. Of course we also have some good recommendations for online casinos. In the table below are some of the best providers for Thunderlick online slots. Bonus offers and free spins are also available! Pick the casino you like, all of them are UK licensed.